I must first tell you that I had NEVER fished before in my life. 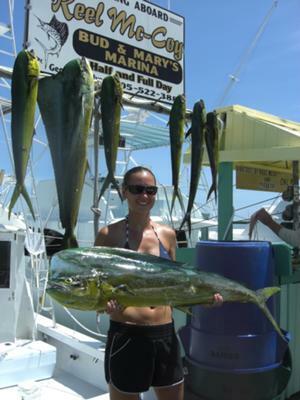 My friend loves to fish and told me I have to try fishing down in the keys because there was "supposedly" nothing like it. Well, when I heard that I had no idea what I was in store for. A group of friends rented a charter down In Islamorada, FL where there was a very young guy as captain and only one mate. We weren't really sure how that was going to work with 6 girls whom were not avid fishers. We went out in the morning before 7 and when we got a few miles out to sea we slowed down and the mate began loading up 6 poles with bait. Within minutes we had fish on every single pole. We all thought it was the most exciting thing to reel them in and have to wait for the next one to be removed and measured. This continued for hours of catching one right after the other and only keeping the ones that were good size to eat. The exciting part of the day came when the captain yelled down that he saw 2 bulls and 3 females. We weren't sure exactly what this meant but we sure found out. It was amazing to listen to the captain yell how many yards and what time on the clock the fish was, and walla - a line went out with just the right bait and that fish would bite. One after the other he got all five fish on and we were reeling them in. Your story simply surprised me. I also went fishing once. I know the thrill it gives us. However, the bull you caught is amazing and as another angler I feel a little bit jealous of you.